In spring 1981 I signed a license agreement with Coronet Boats of Slagelse Denmark. Coronet would manufacture the blades, and I would create new designs. Coronet was a well renowned boat building company, manufacturing sailing yachts as well as motorboats. Some of the designs by world famous yacht-sailor Paul Elvström. Coronet had declining turnover in the boat business, and was ready to try a new challenge for their skilled staff, that had worked with fibreglass for many years. Coronets predecessor firm was Botved Boats founded in 1951 by Ole Botved. From 1981 the blades were known as AeroStar blades. Coronet was later reconstructed and renamed to Alternegy. Later the name of the company became Danish Commercial Energy Research A/S or just DCER. Coronet workers were trained by Økær Vind Energi employees in summer 1981. In addition to moulds transferred from Økær, new and higher quality moulds were made in 1981 for 4 of the 5 different Økær designs. November 24th - 25th 1981 - a Hurricane hit Denmark, causing vast destruction all over the country. Also a Vestas turbine with AeroStar 7.5 m blade failed. Again at Hinnerup near Aarhus. On my way to visit the failed Hinnerup turbine, I passed this failed Windmatic turbine at Viborg. The Økær and Aerostar blades used a blade root system developed by German professor Ulrich Hütter. Glas roving threads running from the root cylinder - around bushings for the root bolts - and back to the blade root cylinder. The system was very sensitive to correct mounting and maintenance of the bolt tensioning. Despite the sensibility of the Hütter root system, still today, after more than 25 years of service - many old Økær and Aerostar blades with Hütter roots are still producing electricity around the world. The Hinnerup turbine, at the edge of a gorge. After the blade-failure of this Vestas turbine - Vestas decided to start up development of their own blade-design. The first Vestas blade was a 7.5 m blade with a SG-cast steel root part. The weight of the steel part was 230 kg. Despite Vestas own blade development, Vestas still purchased Aerostar 7.5 meter blades in 1985. (Which most people do not know). As a consequence of the root fatigue failure in the hurricane of November 1981 in Denmark - a new root system was developed. The Hütter system was to be abandoned, and the blade root was glued into a cast steel cylinder. This root proved very well in the static test of May 18th 1982. Persons seen in the picture are - seen from left: Kaj Holte (craftsman of Alternegy), Peter Hjuler Jensen, RISØ Test Station - Mr. Petersen of Alternegy, Hans Lilholt of RISØ Materials Research, Erik Grove-Nielsen, Flemming Rasmussen of RISØ Test Station, and unknown person. However this new steel-root design led to a 15 % increase in blade price - Only 5 sets were sold. (Bonus and KL van der Linden). A cheaper - enhanced version of the usual Hütter type root was chosen by most customers. In 1985 we made the first blade with inserted steel studs - at the AeroStar 12 meter blade. Today a similar system is used by a. o. LM Glasfiber and Vestas. Visionary American politicians opened a great marked for the worlds Wind Industry. Also the Danes grabbed that opportunity. In 1982/1983 the first Danish wind turbines were shipped to California. Until 1986 this Californian Wind Rush kept Danish companies busy, especially the last weeks of the year, as turbines should be commissioned, and on line before December 31st, in order to secure the investors their federal-, and state- tax credits. EM Fiberglas, Sønderborg Yachtværft, Rimas, Kværkeby Glasfiber. To ensure correct curing of the thin laminates near the blade tip hot air was circulated to the tip area. In years 1985 to 86 a stringent quality control system was implemented. In 1985 a 9 meter blade was developed for 100 kW turbines.. 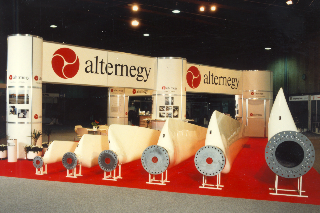 In 1986 a 12 meter blade was developed for 150 kW turbines. In 1984 Erik Grove-Nielsen established a four-blade fatigue test facility at Sparkær. In the black boxes the exciters are located. An electric motor rotates an eccentric mass near the eigenfrequency of the blade. At a low energy consumption the fatigue test can run for months. Data acquisition equipment was placed in a nearby container. I had a cable to my private home 1 mile away. A microphone and amplifier in the central hub allowed me to listen to the sound of the fatigue test in our sleeping room! 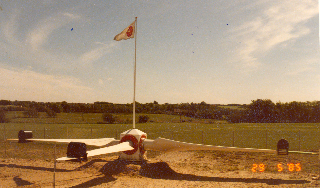 In 1984 RISØ performed some fatigue testing of an AeroStar 7.5 meter blade. The system was based on an iron core oscillating through the magnetic field of a solenoid (coil). AeroStar blades was delivered to 26 countries around the world - from arctic climates to hot desert areas. For blades used in Palm Spring area California, Vestas wanted a static test performed at 60 °C (140 °Fahrenheit). The test was performed at RISØ inside a heated tent on July 11th 1984. In Lodi, California, in a former ultra light plane factory. In new buildings in Crookston, Minnesota. Nordtank 55 kW turbines were placed on a new pier at the Ebeltoft car ferry harbour, near Nordtanks domicile at Balle. At RISØ, near Copenhagen turbines were tested, but facilities for blade testing was inappropriate, only one test rig for maximum 11 meter blades existed. As I saw the need for extensive testing of blades in static and fatigue tests, I decided to enlarge my private fatigue test-station at Sparkær with a complete test facility with static test hall, material laboratory etc. 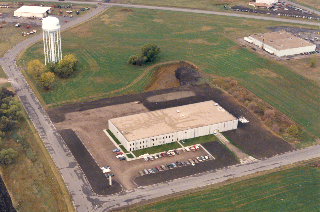 1985 - 86 Erik Grove-Nielsen builds a 0.8 mio.US$ blade test facility for AeroForm at Sparkær. 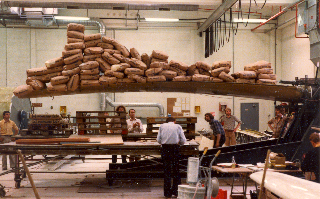 In 1986 we had testing facilities for simultaneous fatigue testing of 4 blades of maximum length 20 meter. The new static test hall allowed a maximum blade length of 20 meter.